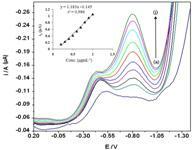 The electroanalytical behaviour of artesunate (ART) in phosphate buffer of pH 3.51 at a multi-walled carbon nanotubes modified glassy electrode (MWCNTs/GC) has been investigated using squarewave, differential pulse voltammetry (DPV) and cyclic voltammetry (CV) techniques. Cathodic peak of artesunate is greatly improved at MWCNTs modified GC electrode (GCE) as compared with the bare GC electrode showing excellent electrocatalytic activity towards artesunate reduction. The peak current showed a linear dependence with the drug concentration over the range 2.0 to 20 µgmL-1. The calculated limits of detection (LOD) and limits of quantification (LOQ) are 2.49 ngmL-1 and 8.27 ngmL-1 by SWV and 54 ngmL-1 and 182 ngmL-1 by DPV respectively. The method was successfully applied for artesunate determination in bulk form and pharmaceutical formulation.